Vacancy from Sindhu Bikash Bank Ltd.
Sindhu Bikash Bank Ltd. invites qualified and competent well-wishers to join our team and accept various opportunities, for which you may have been dreaming a lot, have confidence to excel upon and produce significant growth for yourself and the bank. If you consider yourself as a person of high integrity and deeply committed to put yourself within professional ethics and have the willingness as well as capacity to sacrifice immediate benefits to generate long term recognition and value, you may be our choice. > Minimum 10 years Banking Experience consisting minimum 5 years in management level in any commercial bank or national level development bank and proven track record of managing various departments. > Must have excellent Knowledge of banking and strong desire of developing self, contributing most and evolving as CEO within reasonable time. > Minimum 8 years of Banking Experience consisting minimum 4 years in management level in any BFIs. > Must have proven track record of leading various departments in financial institution. > Minimum 4 years of total Banking Experience and at least 2 years banking experience in related function. > Required for HR, Credit, Finance, Strategy and Institutional Development and Operation Department. > At least Bachelor degree in Management with minimum 2nd division marks or 2.5 CGPA. Master’s Degree and experience in credit function preferred. > Bachelor degree in Management with minimum 2nd division marks or 2.5 CGPA. 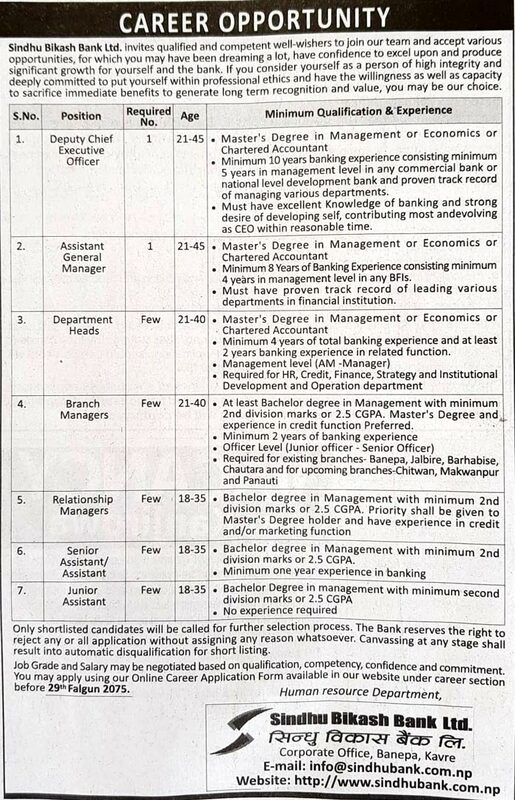 Priority shall be given to Master’s Degree holder and have experience in credit and/or marketing function. > Bachelor degree in management with minimum 2nd division marks or 2.5 CGPA. Only short listed candidates will be called for further selection process. The Bank reserves the right to reject any or all application without assigning any reason whatsoever. Canvassing at any stage shall result into automatic disqualification for short listing. Job Grade and Salary may be negotiated based on qualification, competency, confidence and commitment. You may apply using our Online Career Application Form [ LINK HERE ] available in our website under career section before 29th Falgun 2075.